Item # 304051 Stash Points: 1,799 (?) This is the number of points you get in The Zumiez Stash for purchasing this item. Stash points are redeemable for exclusive rewards only available to Zumiez Stash members. To redeem your points check out the rewards catalog on thestash.zumiez.com. Add a staple to your hat collection with the Grade II Burgundy Beanie from Brixton. This 100% acrylic beanie features a mid-weight, chunky knit construction with a leather Brixton label on the front fold-over cuff for a classic silhouette that's ready to take your cold weather looks to the next level. 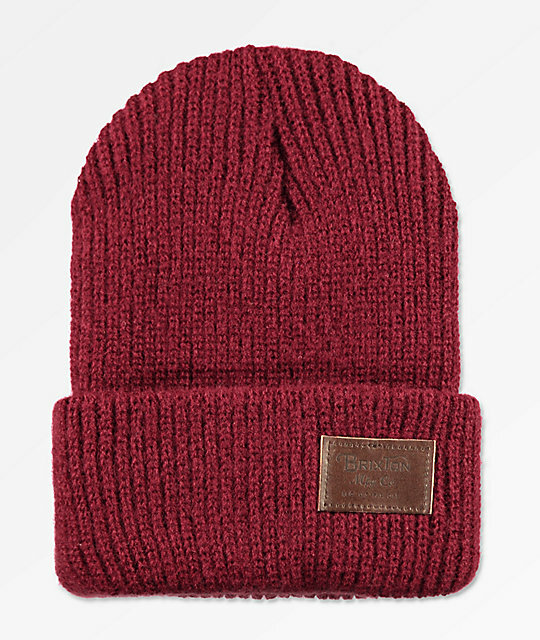 Grade II Burgundy Beanie from Brixton. Leather Brixton label on cuff trim. Hand wash with water, air dry.